Happy Nail Polish Day, everyone! I am still reeling from the effects of watching the series finale of one of my very favorite shows of the last decade, The Americans. (It aired on Wednesday, but Mr. Fivezero and I didn’t have time to watch it until last night.) It was the best series ending I’ve seen for…I don’t even know how long. It was brilliantly written, brilliantly acted, brilliantly directed. It’s gut-wrenching, haunting, and the show remained true to itself to the very last frame. I cannot recommend this series enough, if you were not lucky enough to have watched it from the beginning. with Matthew Rhys and Keri Russell. Anyway, onto the polish! This is my first nail polish swatch in eons. Pardon my cuticles. 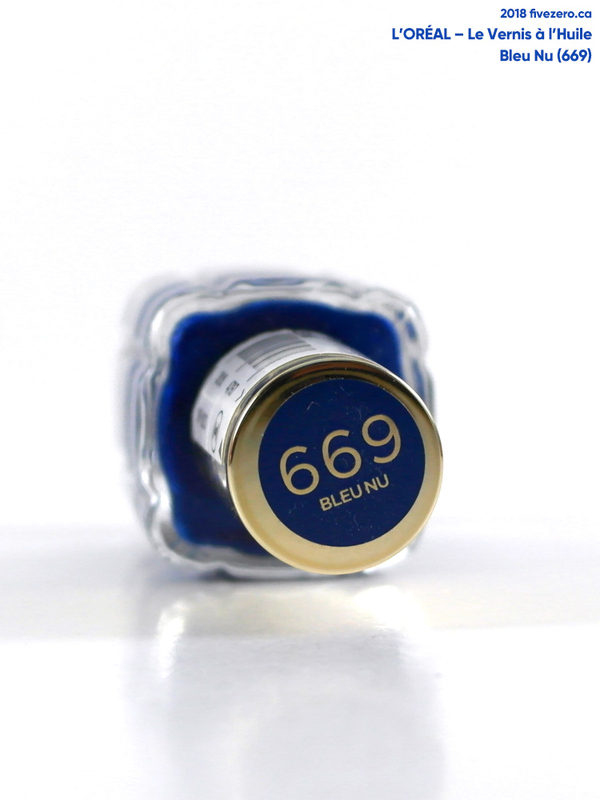 Bleu Nu (442) is a newer release in L’Oréal’s fantastic line of Colour Riche Vernis à l’Huile nail polishes. I spotted it in stores earlier in the spring, but didn’t feel like ponying up $11.99 for a couple of bottles. Luckily for me, I did manage to pick up two from the collection on clearance last month. I got Bleu Nu, Sable Tuileries, and I thought I was getting Rouge Opéra, the red from the collection, but it was just Rouge Amour which I already owned. D’oh! Ah well, can you ever have enough red creams? 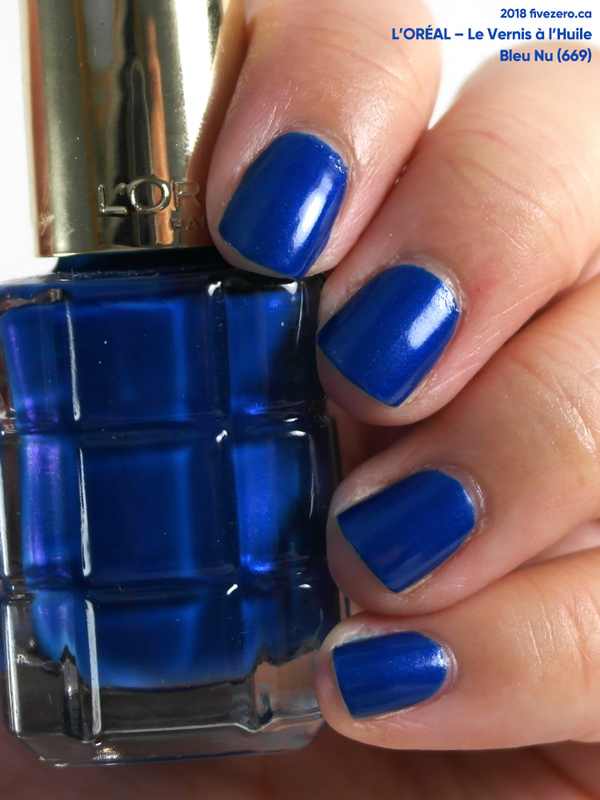 This one is a deeper, electric blue shimmer. My favorite thing about this shade is that it should seem flashier, but actually it has an elegance to it. Really quite nice, though probably fairly easily duped elsewhere. I’ve liked the application for all of these polishes that I’ve tried. Bleu Nu is perfectly opaque with two coats, and it applies pretty nicely. The brush is paddle-shaped and not overly wide. The polish could be a little shinier when dry; as it is, it looks a little satin-y. No big deal if you use a glossy top coat over it, though. This polish is scented, and when dry it has that unique L’Oréal lipstick fragrance. These polishes are pretty much priced like Essie (both owned by L’Oréal), at CA$9.99 vs. a buck or two more for Essie in Canada. When they go on sale, the prices are essentially the same. If you like a wider paddle brush, these are definitely a superior option to Essie’s polishes, which have slender, rounded brushes. 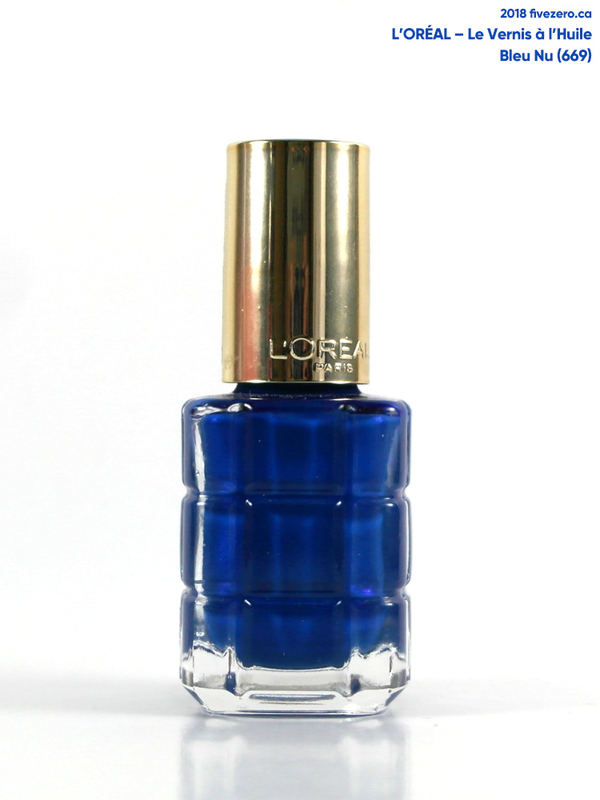 L’Oréal Le Vernis à l’Huile Nail Lacquer is 0.45 fl oz / 13.5 mL. The polish is free of toluene, formaldehyde, formaldehyde resin, dibutyl phthalate (DBP), and camphor. It is made in France. L’Oréal was founded in 1909 and is the largest cosmetics company in the world. It is based in Clichy (a suburb of Paris), France. Its first product was a hair dye called Auréale, which presumably led to the development of the company’s present name. Beautiful blue shade! Like a mediterranean swimming pool! 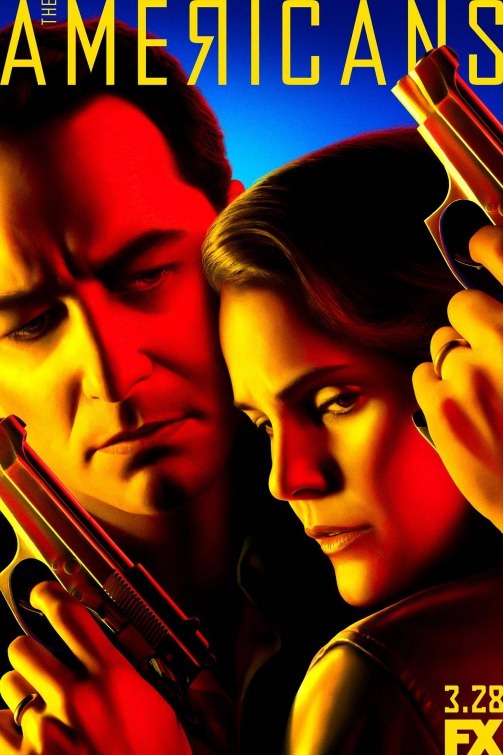 The Americans is a show that I’ve been wanting to watch – I’ve heard so many great things about it. I’m glad the finale lived up to the rest of the show. These Vernis à l’Huile nail polishes are some of my favourites in terms of formula! I’m actually rocking one right now – Rose Ballet. Applies and wears like a dream. The answer is you can never have enough red creme polishes. Never. Sooo late replying. The Americans recently picked up an Emmy for Matthew Rhys’s performances. Shame Keri Russell didn’t get one, but the series ended brilliantly. 😀 Hope you’re doing well!!! 413,083 times by nail polish fans!